Thread: Singlespeed for XC Racing? So I'm planning on entering a bunch of the cross country races in Oregon this year in the single speed category and I am looking for suggestions on what kind of bike to buy. My budget is somewhere around $800. So far the only bike I've checked out is the Redline Monocog 29er. Really cool bike but I couldn't tell if it would be good for racing. Do any of the bikes in this price range stand out as good for racing? with the monocogs... go with the flight model. it's lighter, better steel, and has better components. the GF rig (08) seems to be getting some acclaim lately. it's a bit more expensive, but would be worth it, prolly. you could always look for something used as well. i've seen plenty of people race on monocog flights, and even the regular monocog. On One makes a carbon rigid fork with 48mm of offset which is pretty close. That's what I am doing with my 08 Rig. I think going used is a great way to go. Last year I raced a converted '96 Stumpjumper, and a Soma Juice I got off ebay for $500. This year I'm going all Indy and racing a new Karate Monkey with those new fangled disc brakes, but that's only because I didn't like the way the Soma looked. Forgot to mention, I've got a Niner One9 size large if interested. 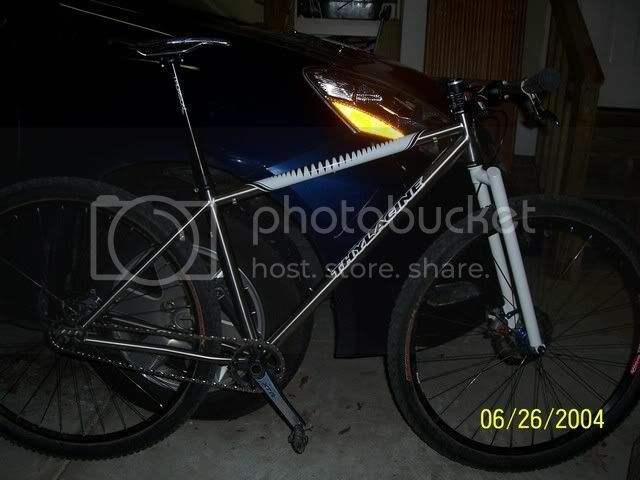 Frame only, though I have a Kona P2 29 fork that works very well with it. Thanks for the responses. Right now, I'm leaning toward a rigid fork mainly because of price, fun-factor and that it would make a much better commuting / cyclocross bike. I haven't found the Monocog Flight but last night I tested out a GF Rig 06 ($1000) and a Kona Unit 29er ($1000). Both were pretty cool but the geometry of the Kona felt nicer to me. The 08 Rig geometry is different then 06. I think 1000 would be a bit high for the 06 Rig. Assuming you are getting a 29er SS to race a rigid fork is the way to go. The wheels will overcome most the small momentum robbing bumps that XC race suspension handles and the overall setup will be lighter. If you decide to run a 26er SS (still a valid option) you will probably want a fork up front. You will want something as STIFF as possible for the weight. Personally I love the new Magura Durin but on a budget a RockShox Reba is probably your best call. How many people in the singlespeed division of these races are going to have rigid forks? Is that going to be a real handicap? A greater percentage of people riding/racing singlespeeds go rigid than geared riders do. I do not think that it is a limiting factor; the guy who wins the race probably would have no matter what they were riding. Let me know what you think of the Soma vs. the KM. Other "issues" aside I find the BB area of the Juice to be too flexy. Any coments on how the KM compares? I never noticed any flex out of the Soma's BB, but I'm only 135 lbs. Overall it's a great riding bike. The KM seems a little more maneuverable to me, and the Surly brand cromo has all the resiliency and ride quality of the Soma's Tange Prestige. Moreover the KM is black, which makes it infinitely cooler than the Soma (which is orange). Well for me I don't feel a thing after the five hour mark, everything goes numb and jarring doesn't affect me that much... lack of fitness does. As for racing XC, in elite class racers have the legs. Witty me can't compete with them no matter how advantageous my bike could be over theirs, they could be riding a 15" BMX and still kick my arse. I raced a OG redline monocog, the red 26" 110spaced v-brake only red version last year, and will probably race it this year also. I am running a kona butted p2 v-brake only fork which saves a bit of weight, but I'm running redline flight 2 bmx cranks and a 34t profile ring, so the whole bike still isn't very light 25-26# I think, but it fits and I like how it rides. I had a 18" 03 unit running a mullet rigid which was nice, but the top tube was a little on the short side so I sold it to a nice female racer who got to race it once when her FS bike had a faulty rear derailer, she really liked how it rode and how light it was, later in the season I sold it to her along with my 2000 z2 atom 80 fork. Maybe should have kept the fork since I noticed I get fatiged hands and wrists at some of the races running the monocog rigid. Hadn't noticed the fatige when just ridding, but racing is not just ridding. While the red-orange is not bad on the Soma, you just can't beat black. the guy who wins the race probably would have no matter what they were riding.